The sphinx is the mythical creature with the head of a woman, the wings of a griffin and the body of a lion. 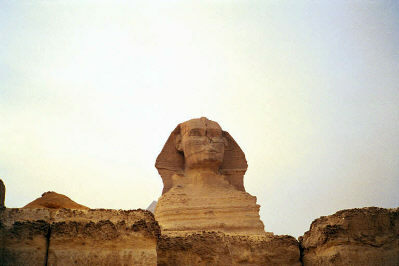 The sphinx stopped travelers on the road to Thebes and posed them a riddle. If they answered wrong, they died. Oedipus was asked the following question:"What is that which in the morning walks on four legs, at noon on two, and in the evening on three?" Oedipus replied that a human crawls as a baby, walks erect as a man, and leans on a cane in his old age. Hearing this, the Sphinx promptly ran off and killed herself. The grateful people of Thebes made Oedipus their king.